Level crossing. Three tracks. The two in the foreground have no train coming, and the automatic gates for them are open. There’s a train approaching on the other track, and its gates are closed. Logic would suggest it’s perfectly safe, and perfectly legal to walk through the open gates, right? A COMMUTER has been taken to court and fined for doing what thousands of people do every day in Melbourne – walking through the open gates of an automated railway pedestrian crossing. (e) when directed not to do so by an authorised person (conduct). Specifically, at stations with island platforms, only the gates relevant to the tracks with passing trains are closed, allowing people to enter and exit the platform, or to cross half way. Simply put, I think the law is out of date. It matches a time when there were no pedestrian gates, just the “maze” — the layout of railings designed to ensure you looked both ways before you crossed. Back then, it made sense to use the vehicle lights/bells/booms as your guide. For Rail Safety Week, Victoria Police are doing a blitz on level crossings. On Wednesday morning I spoke to some plain clothes police who were at the level crossing at Bentleigh station. They implied they agree the legislation doesn’t match reality, and said they’re taking a “common sense” approach and only booking people trying to get past closed/closing gates. Fair enough. But the gentleman in the Age article obviously didn’t get the common sense approach when he was booked by an Authorised Officer. But the department does not intend to review the law, saying it promotes safe behaviour. ”It is important that people act safely at railway tracks and crossings at all times and do not take it upon themselves to act contrary to the warning signals,” a spokeswoman said. I wonder if they even fully understood the question. At pedestrian crossings providing access to an island platform (including those at road crossings), the pedestrian gate pair for each track shall operate independently from the other. ← Previous Previous post: Can you combine street art, classic video games and a Melbourne street map? Yes! Actually I think that it is either poor drafting – or it means exactly what it says. The numbering is a dead giveaway – (ab) indicates that the subclause has been added in at some point. Looking at the official copy of the statutory rules on the web indicates that 39(1)(ab) was inserted in 2008, so it’s not a holdover, it’s recent. The good thing is that these are Statutory Rules, not legislation. They can be relatively easily changed by DoT and it is not necessary to go to parliament. As the PTUA it might be interesting to make an FoI request to see the DoT file for the change and see what they intended to do. I was not aware of this law and I have been using the train at Hughesdale for nearly 20 years (safely!). There must be dozens of people doing the same thing every day at this station. The inspectors would be far better employed in fining people who go around closed pedestrian gates and even diagonally cross the road across the tracks when pedestrian gates are closed. It’s astounding that we have a magistrate that lacks an “average man” level of logical reasoning. This man should have been let off. Perhaps the mandatory sentencing push by government has the judiciary too scared to think for themselves on any issue. The legal system should ultimately be able to protect citizens from petty administrative people like to officer that wrote the ticket in the first place. I wonder if the laws in other states are more sensible, or are they just as stupid as here? I think the most ridiculous part of this rule is that the DoT has said it has no intention to amend the ‘law’. This is clearly a contradictory set of laws/PTV SOP. If the government wants to keep the law, then PTV MUST change their SOP to ensure that ALL pedestrian gates close when the road lights are flashing. We are accustomed to having gates for safety, but if said gates do not operate within the law, why have them. The magistrate was right in saying he technically broke the law, but the law he broke is very poorly conceived for the huge majority of crossings in Melbourne. It should be amended to specifically exclude pedestrian crossings where automatic gates function, or signs need to be erected at all crossings where this may occur to warn the public if they want to keep the law in its current stupid form. If they were in opposition, I wonder if their response would be different? On a side note, it makes it clear the different agendas of Police vs. Authorised Officers. Ill leave that alone for now. Oh also Daniel, when has a government ever operated within Logic? That is completely absurd. If its illegal to cross why are the gates staying open? This shows the disconnect between the engineers building the gates and the people writing the laws surrounding them very starkly indeed. @Julian, the people signing off on the pedestrian gate specifications are the same public servants signing off, or operating under the relevant legislation and regulation. It’s simply a discrepancy that needs resolution without undue delay. That guy obviously never got the look right, look left, look right again theory sorted. Now I was quite outraged when I read this story in “The Age” on Friday, but scrutinising your photo here, which you apparently took at Bentleigh station, I was a bit surprised to see that there is actually a prominent sign telling you not to use the pedestrian crossing while the lights are flashing or the alarm is sounding. So it is not some obscure regulation that is being ignored. The sign is right there. “You have been warned”. So I am rather surprised this question hasn’t been raised by some nitpicker long before now. Is there one of those signs ( or four of them ) at Hopper’s Crossing ? You should also take a look at the google street view image of your crossing, from the east side looking west in the middle of the road, and tell me what the old lady in the blue top is doing lurking in the shrubbery, between the tracks, on the opposite side of the main road from the pedestrian crossing. @enno, the presence of the sign does not excuse the law and the operation of the gates (and hence, user behaviour, and safe practice) being so badly out of sync. You will note the presence of “red man” lights. There are also alarms separate to the bells, which sound with the closing of the pedestrian gates. I agree, the lack of consistency between the actual operation of the gates, and the law, is unacceptable. My point being however, the signs make this inconsistency quite plain to see, rather than hidden in some law that nobody has every actually read. The story in Friday’s Age certainly didn’t mention those signs. I was made aware of these signs recently too. I certainly never noticed them. And the fact that most people are unaware of this inconsistency suggest the signs are not enough. Regardless, I don’t believe this changes the situation. At Hoppers Crossing, the flashing lights are actually not visible from the pedestrian crossing, especially while standing in the island part of the pedestrian crossing. I was at Hoppers Crossing Station this morning and I saw the “Do Not Cross etc” signs but they are only visible to pedestrians approaching from the bus station and from the freeway sides. When I was exiting the station from the ramp there were no signs, that I could see, warning me not to cross the tracks. By the way, I think the fine should not have been issued. I have been doing the same thing the past 10 years and until I read the article in The Age I was not aware I was doing anything illegal because I thought that when the gates were open that a person could cross the tracks. The gates at Mitcham have their own warning buzzer (but no lights). When it turns off, the gates open and people walk through. This often happens when the nearby level crossing is still closed, because (presumably) the system is programmed to allow pedestrians through, between closely spaced trains, in a time period too short for traffic to begin flowing and be stopped again. If the law also prohibits this use of the crossing then it is simply designed to trap people into breaking it. I wonder how close a pedestrian crossing has to be, to be defined as adjacent? My guess would be that the pedestrian crossing needs to have the same PCR number, i.e. infrastructure identity, and is therefore technically considered as one unit rather than two separate installations. But I don’t think it’s reasonable for the public to have to know that. For example, the five crossings at Bentleigh (2x one track, 2x two track, road) all have the same identity: F0165: BB. On the Sandringham line, there’s a level crossing at Lincare Rd (past Hampton) with a pedestrian maze on the down side, B0182: BB PO, but there’s also a pedestrian crossing about 100 metres on the up side of that, joining the two halves of Crisp St and Deakin St (B0181: PG). That crossing has pedestrian gates. Could Crisp St be considered adjacent to Lincare Rd? 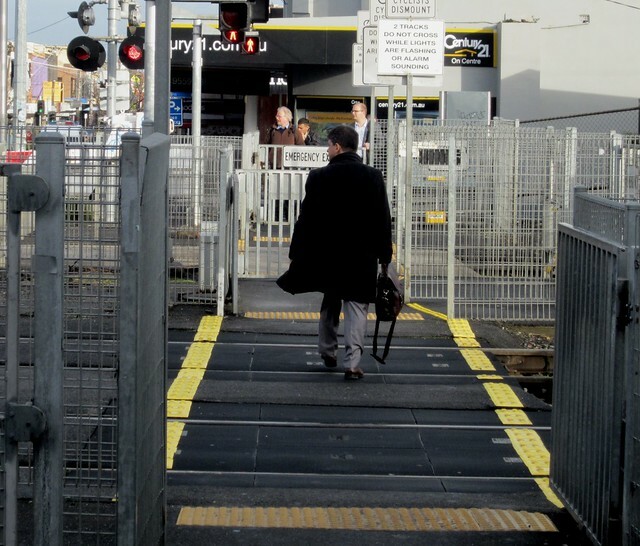 Or to take another example, is it legal at all for pedestrians to cross at the New St gates, since the level crossing portion is always closed but has not (AFAIK) been properly abolished? You could argue that the warning system there is always active, if you ignore the huge blockades on either side. @David, if you were crossing at the Crisp Street pedestrian crossing, can you actually see/hear the warning signals at Linacre Road?